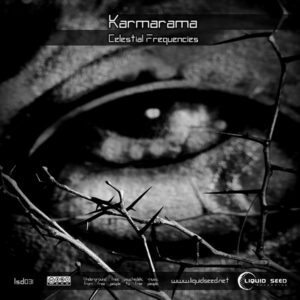 Liquidseed Recordings is happy to share Celestial Frequencies, an ambient album by Karmarama (George Chondrakis), born in 1988 and now residing in Chios Island, Greece. He has been a DJ in the past and involved with music from his young age, now he starts introducing his own style of electronic music. This release is full of dark shades, making it a real tool for relaxation and inner journeys. The deep, fat sound truly speaks inside ourselves and cannot be passed by. We dedicate this album to all people having hard times around the world, especially those violently moved away from their homelands. Mastered by Acid Lagos @ Liquidseed Studio, Greece, with photography by Dionisis Konstantinos Skoutelis and final edit by Angelo Zs. MP3 Download | FLAC Download | WAV Download · Download count: 7,055. This is just the consciousness the moment requires and music is a great vehicle for transformation. The refugee is a direct result of a cause that is war. War in turn in fueled by politicians who are tools of the military industrial complex that makes blood money from the massacre of innocent people. The subsequent displacement of people who have their lives ravaged by war are labelled as the refugee. The poor hapless refugee endures untold hardship risking death and hazardous journeys to make it to a land where there is at least refuge from bombs exploding. A huge humanitarian crisis that can only be averted through pacifism brings displaced human beings to distant shores. While many do find the scope for better lives several are subjected to racial abuse and persecution by an uncaring population at large. Having said that some humane souls among people of Greece, Italy and Germany , among other countries, have opened their borders and hearts to refugees and are helping them get on with life the best they can. A heartfelt thank you to the people who man rescue ships in the Mediterranean and the volunteers in Lesbos and all those who care about the suffering of the nameless. More power to Karmarama for this significant gesture in great music. Big thanks to Liquid Seed Recordings and Ektoplazm! No words can really describe the beauty of these tracks. Amazing, amazing work! Amazing tracks, very good job!! !